a super idea - I really like this! That’s my approach too: composing stills with period matching items. OK, no watch here, so a little bit off topic – next time I’ll take a photo of my typewriter together with a watch matching the period of the typewriter. In any case: really a brilliant idea to pair period relating items with a watch. 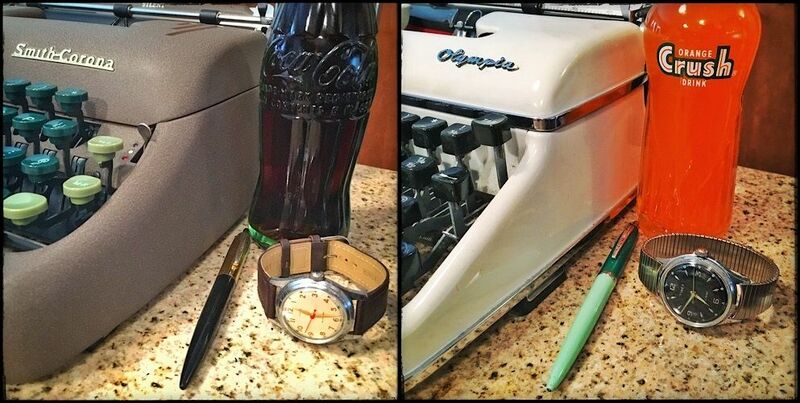 Never thought about pairing a typewriter with a watch - but it's a great idea. nice pics of the US Time watches. Now you just have to find period correct bands \ straps. Thanks! As you don’t have a 1911 to be photographed with the olive-drab US Army typewriter: a captured Luger would also fit! No, seriously; why don’t you pair it with a WWII wrist watch? Here is another resource showing the band selection of the era. Note the stitched leather bands with a single hold down.